Frenchman Loris Baz claimed his second WSB win in the second race at Silverstone in a race that again started dry and finished in tricky conditions. Baz took to the front after a strong start and looked in control when the rain flags came out on lap six. Despite the rain flags, the pace stayed high until it really began to rain on lap 17, when the race was red flagged. Suzuki rider Jules Cluzel crashed outof second place on lap 17, as did Leon Haslam, who high-sided and landed heavily on his injured leg. The race was taken back a lap giving Cluzel his first WSB podium finish ahead of Eugene Laverty in third. Race one winner Jonathan Rea was perhaps hoping for trickier conditions and again came on strong as the conditions worsened, finishing in fourth place. Fixi Crescent Suzuki rider Leon Haslam, fresh from his third place in race one, took the lead on lap 12, but was then pushed back to sixth as he ran wide getting caught up with the riders around him. Chaz Davies' hopes of a win were shot down when he suffered a mechanical problem on lap 15 while in second place. 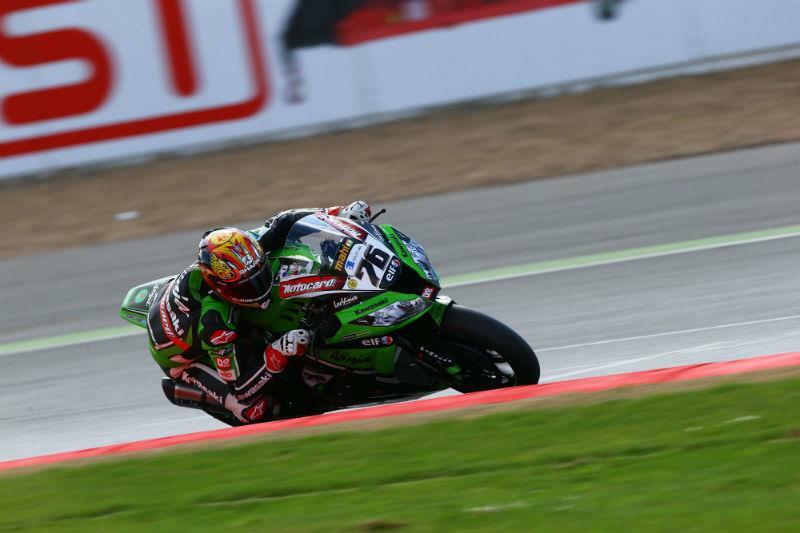 Kawasaki's Tom Sykes again struggled in the conditions and finished in seventh place, behind rival Sylvain Guintoli in sixth. Guintoli still leads the championship.